Mivila Foods is the number one distributor of choice among chefs for quality groceries, industry competitive pricing, and reliable service. For nearly fifty years, we have been serving customers throughout the Tri-State area with thousands of wholesale brand name groceries, beverages and supplies. We are committed to exceeding our customers' expectations with every delivery. 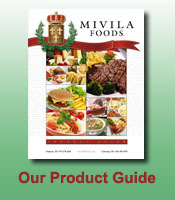 Join the finest establishments of the area and make Mivila Foods a part of your kitchen. Recognized by the food industry as a "showplace," Mivila's state of the art distribution center was designed to meet modern standards for all groceries. Our new fleet of refrigerated trucks are maintained under a strict sanitation schedule, assuring that they conform to the rigorous standards you expect from Mivila Foods. We invite you to explore our product catalogue for a full listing of our stocked items. Or, contact one of Mivila's helpful and courteous representatives for assistance. If you need it, we will get it! Customer satisfaction is our top priority! We not only strive to be the best wholesale food distributor, but also do all we can to make our customers be the best in their business too, through all of our quality products and value added services. We aid all of our customers in gaining and maintaining a competitive edge. It is no wonder that Mivila Foods continues to be the preferred wholesale food supplier for customers in the Tri-State area! TIRED OF RISING FOOD COSTS? Mivila scans the markets daily for the best values. With rail-car & truckload deliveries, we're able to lower costs & pass the savings onto you! Our private brands offer quality, variety and exceptional value.